Crikey! It's less than six weeks to the Wedding of the Year. I've spent today working on the quilt, apart from a brief break to make and eat a cottage pie, and I think I'll be doing the same for most of this week. It's all very well me thinking that as I'm "quilting as I go" the quilt will be finished when I add the final section but those sections are getting larger and larger and the quilting is taking longer and longer. Today I added the fourth section with hand pieced blocks, Florida Star and English Wedding Ring this time, and then added a 2.5" border around the whole quilt in the small floral/cream fabric. No more whole quilt pictures until David and Jessica have received it now. Last week was school holiday and DH and I took Saz and Sam "down south" for the week, to Essex (now you know how I learned to cope with those "killer heels", in white, of course). We stayed in a budget hotel and had some good adventures. Sam was a star, coping with lots of new experiences, and Saz, Al and I managed without one cross word even though we were all in the same room! It was a good trip except for one downer, my parents didn't feel up to seeing us, even briefly. I'm not sure what's going on there, they haven't seen Sam since my 50th birthday - four and a half years ago! I get in a tizz if I don't see Sam for four and a half days!! We did have a good time with my sister though and Sam met his Aunty Clare for the first time, all good. All the things we did with Sam were things I did as a child, I did with my children (and with my pupils) and now I'm doing them with my grandson. He enjoyed the Science Museum, coped serenely with the push and shove of rush hour London, went over the Thames on the Queen Elizabeth II Bridge and back under the Thames in the Dartford Tunnel, went on a big train to London and on an underground train. When the weather is warmer we think we'll try a trip on the river and maybe take him on the London Eye and of course, London buses (which his great-great-grandad used to drive). Sam helping Aunty Clare with her jigsaw. Waiting for a train at Stratford. Dressing up like a Roman at Lullingstone Roman Villa in Kent. Scaling the ruins of Eynsford Castle. On an Underground "Tube" train in London with Grandad. Learning about water power at the Science Museum in London. Sam waited patiently while a robot drew his portrait in sand. In the Apple Store with Grandad. Sweet dreams Sam, we had some busy days. Your quilt is coming along beautifully. Good luck over the coming weeks getting it finished. You have made some wonderful memories with gorgeous Sam, looks like he had a fabulous time. Sorry about your parents :-( I know how you feel as my Dad wouldn't let me visit him when he was sick. (I lost him over 10 years ago). The quilt is coming along nicely! I know what you mean about the quilting growing in length the further towards the edge you get! Sit back and remember the fun you had in London and let the needle do the work. Do stop for a rest and a bit to eat from time to time. The quilt is looking fabulous! The quilt is fantastic. I don't see how you can get so much done with all those distractions. Sure does look like fun! The quilt is looking great and Sam now has such a lot of good memories.Have you made him a scrap book yet? 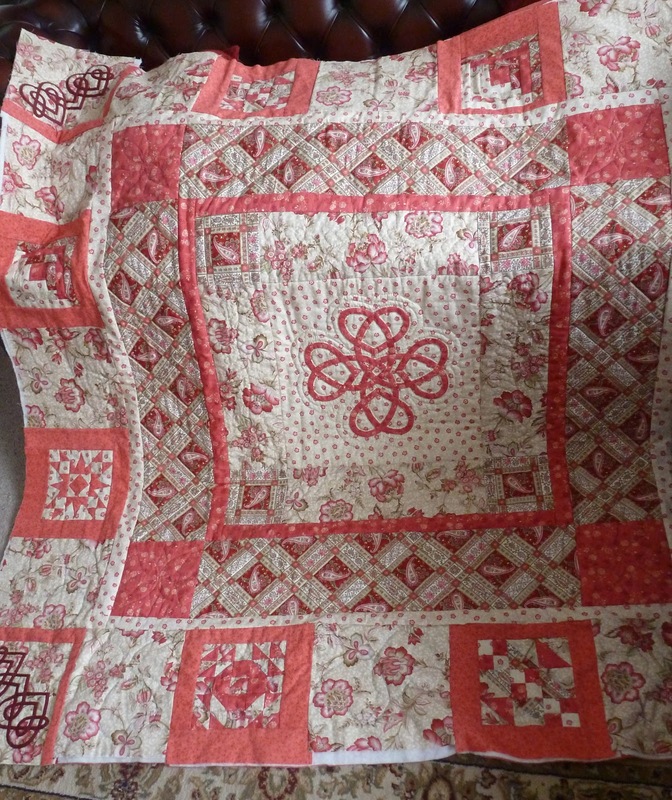 The quilt is looking better, and more lovely each time you show it! Sounds like you had a lovely time, except the parents, how strange! You could take the train from Waterloo to Windsor? Open top busses, river boat, the castle, and of course lots of planes going over - and a cuppa at mine?